Dr. Willingham is originally from Birmingham, Alabama. After completing his residency in 2001, he moved to the West Palm Beach area where he has practiced for over 15 years as a hospital-based physician and Internal Medicine physician. He has extensive experience in preventive medicine, weight loss, geriatric medicine and management of chronic medical issues such as diabetes, congestive heart failure, and hypertension. Dr. Willingham has a unique and compassionate approach to making his patients feel comfortable and at ease. 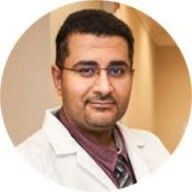 Dr. Abdallah is originally from New Jersey and is a member of the American Osteopathic Association, the Florida Osteopathic Medical Association, and the American College of Osteopathic Family Physicians. He speaks English, Arabic, Spanish, French, and Portuguese, which makes him accessible to patients from a variety of cultural backgrounds. He treats a wide range of medical conditions and he is eager to help the wider community receive the care they deserve.